« Welcome National Geographic Readers! 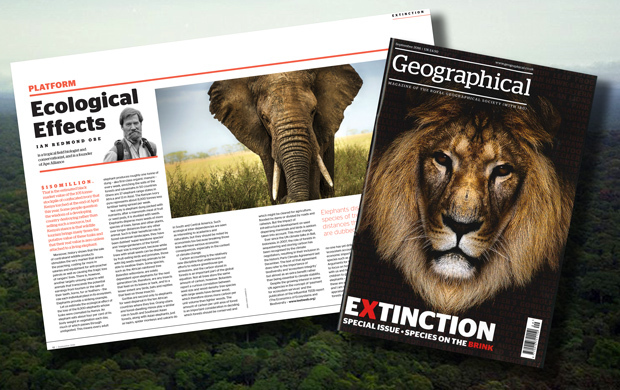 Welcome Members and Fellows of the Royal Geographical Society, and other readers of the September issue of the Geographical Magazine special issue on Extinction! Please find below a selection of links to “virtual ecotours” of species mentioned in Ian Redmond’s article. Make sure your speakers are turned up, or better still use ear-phones to enjoy the ambient sound of the ecosystem you are visiting. As you look up, down and around the 360 spherical panoramic photographs in which you find yourself (using your keyboard arrows or by dragging your mouse cursor) watch out for ‘hotspot’ icons which either bring up stills and video video or take you to the next location. If you are using a tablet or smartphone, click on the ‘gyro’ icon at the bottom of your screen and you will be able to move your device in space to look around. Finally, if you own a VR headset, download the apeAPPVR for a totally immersive virtual visit to all six species of great ape, plus an extra gorilla sub-species as a bonus!